This menstrual cup is featured in a beautiful Amethyst purple color in the standard size range -perfect for most users. I prefer this cup to the original because it opens with 0 hassle and I’ve never had a more secure fit. I am extremely happy I finally bought a cup. I was on the fence for awhile and my sister recommended this one. I read all the instructions and did a practice run before my actual cycle. I found that extremely helpful because I knew what it felt like, figured out the best fold for me to insert and tested out some exercises. I was terrified some movement would cause it to shoot out, can happily say that didn’t happen! I got the hang of inserting and taking out. It did reposition further up than I thought it would but I was able to easily remove by following their recommendations. I like the ball grip, it was easy to find and I can’t feel the cup at all during the day! I have a light-medium flow and I went the whole work day and gym without having to rinse. The sport firmness is perfect for me and I would absolutely order this again! Might order another just to have an extra on hand. I got this cup after having leak issues with 2 other brand's I've tried. I figured maybe the firmer material would help prevent leaks on my heavy days. Turns out I still leaked on the heaviest day, even when emptying it after only a few hours, but the rest of the time it was perfect. I went skiing and it didn't leak at all the whole day! Was a little challenging to insert at first because it's so stiff, but I do think it does the trick for my body, compared to my other cups. I have the ball handle version and like it better than the stem. This is my second brand of menstrual cup. I had gone from a size 1 to size 2 Eva cup, but after having my child, my size 2 Eva was no longer working well. I was having a lot of issues with leaking. I had previously been able to wear the cup for 12 hours without any issues. I took an online cup quiz, and it recommended the Meluna sport. I emailed Meluna and they recommended the size. I am still having some issues with leaking, but only if I go longer than 6 hours without emptying the cup. I am no longer having issues with leaking while working out or doing day to day activities, so the fit is definitely better than the Eva was. I have heard of people having issues with their cervix taking up space in the cup, so maybe that’s why I can no longer go a full 10-12 hours. I love the firmness of the Meluna. It pops right open without any struggles. I love the ball stem. It makes adjustments and removal a breeze. I would be hesitant to recommend this cup to someone who is new to cups though. Although I find the firmness great, even I had a learning curve adjusting to it. I think it’s firmness would make insertion and removal uncomfortable for someone without cup experience. I am hoping as I continue to recover from childbirth that I can go back to 10-12 hours of cup use without leaks, so I am not sure if this will ultimately be a cup for me, but if you are someone who is active and a leaky cup was preventing you from being as active as you wanted, you should definitely give this cup a try. I read the reviews and thought I selected the best option for those who had a baby recently and weaker pelvic floors. This stays put for barely 20 minutes before sliding out into my underwear. Yikes. This isn't my first menstrual cup, and I've heard the suction work each time I insert it so I don't think I'm inserting it incorrectly. Sticking with period underwear for now. This is perfect for me. I originally had a different brand cup that was softer. It would not fully open. I did some research on the firmness levels of different cups and found this one. I have not had any problems with it opening! I am very pleased with it. Great introduction to reusable menstrual cups! Easy to use and appreciated the stiffer material due to its ability to stay put as I participated in more physically demanding activities. I got the ball end and found it unobtrusive. I would definitely recommend for anyone interested in trying out a menstrual cup! I finally was able to use my new cup yesterday. 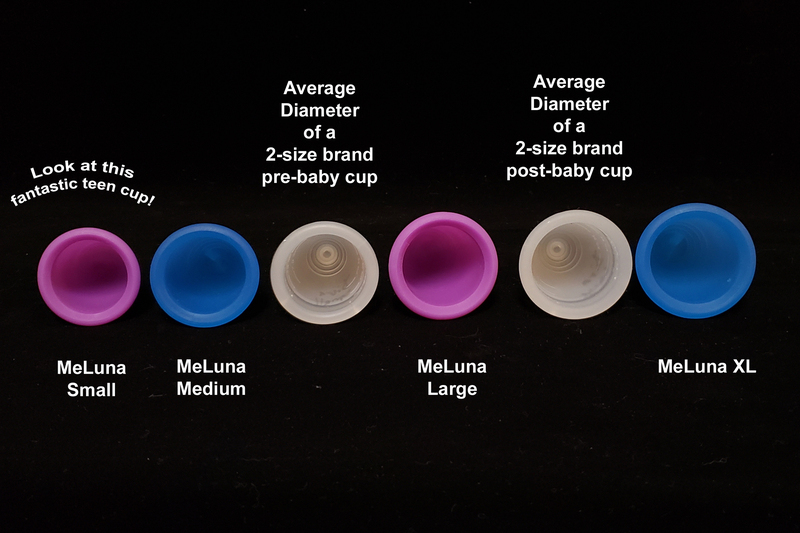 I had previously owned a Mooncup, which I loved and worked great. It was getting older, though, and I had a second baby. It felt like the cup was always on the verge of falling out. I did lots of research and MeLuna seemed to have more options that might solve my problem. Unfortunately it did not. I hoped the firmness of the sport material would help it stay in better. It has not. Maybe I need to continue working on improving my muscle tone. Otherwise, though the cup is excellent quality and I love the ring shaped handle. And the purple too! Hoping I can use it in the future.